The Official Mort Künstler Blog: Meet Mort Künstler at Print Signing! Meet Mort Künstler at Print Signing! Just in time for Valentine's day, Mort Künstler will be signing his newest print Sally's Valentine in Oyster Bay. 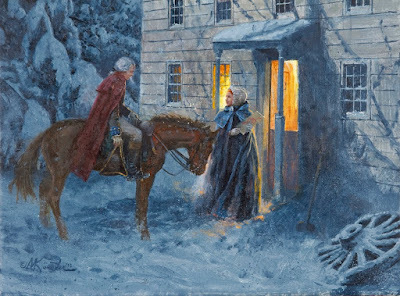 This beautiful painting is a depiction of an actual event – the presentation of the first recorded American valentine. British officer Lt. Col. John Graves Simcoe fell for Sally Townsend, the daughter of a Patriot, while occupying her home which is now Raynham Hall Museum. Mort's signing will be just a block from where this event took place, at Long Island Picture Frame and Art Gallery. Sally's Valentine and other prints by Mort will be available for purchase on site, in a selection of sizes – framed and unframed. We hope you can join us for this special event! A portion of the proceeds will benefit Raynham Hall Museum.